UNIT & Larry recently collaborated on a self-initiated project together for Subjects. Everyday in land scarce Singapore, offers scream from thousands of garnish flyers - some smaller than a postcard, others as big as a tabloid - exhortations from earnest property agents for homeowners to sell their homes and make a tidy profit. Everything’s fine until more than a few in an estate want to cash out enmasse. Then even if you’ve lived there your whole life, the rules of ‘en-bloc’ sales could mean the loss of your home. There is almost nothing one can do to combat this ugly facet of Singapore life, but “wouldn't it be nice?”, we though, if at least the flyers weren’t such bloody eyesore? 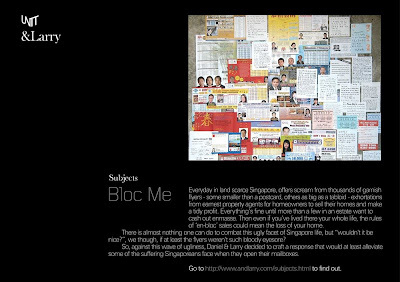 So, against this wave of ugliness, Daniel & Larry decided to craft a response that would at least alleviate some of the suffering Singaporeans face when they open their mailboxes.